One of my first jobs after leaving school was as an apprentice TV Engineer with Rediffusion in their small Norwich branch. I was there only two years (autumn 1973 to autumn 1975) as, during the late summer of 1975, they cut down on the workforce and several jobs were "lost", mine being one of them. 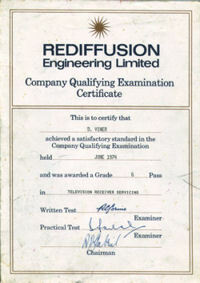 Rediffusion itself lasted until the parent company, BET (British Electric Traction), sold it off to Granada Television and the Maxwell Group in the 1980s. More information on this and other aspects of Rediffusion's history can be found on Gerald Clode's informative Rediffusion site. At that time TV technology was rather more primitive than you find today. The old 405-line service was being phased out, colour had arrived a few years earlier, though colour TVs were still huge compared to their modern-day counterparts. Apart from some of the latest models, most TVs in the field still used valves (or bottles as some TV engineers insisted on calling them). Many of the Rediffusion manufactured sets used PCBs (Printed Circuit Boards) that could be swapped out and an engineer's van always had an assortment of the common PCBs, valves and other components ready for use. As an apprentice with little knowledge of TVs and electronics, I spent the first 6 months between Norwich and the training school in Nottingham - two weeks in one followed by two in the other. At Nottingham, in a class of about 15 to 20 people, I gained basic skills in electronics and television servicing. This led to an examination a few weeks after the six months were up which, I'm glad to say, I passed - see the image above right. Much of the course was to do with fault finding, which meant deciding where within the set the problem actually lay. TV engineers were expected to do basic servicing in the customer's home, only bringing the set back into the workshop if the fault was more complicated. Obviously, it was cheaper if the set could be repaired in the customer's home and this also made for better customer satisfaction as they wouldn't be without a TV set for long. If a TV had to be brought into the workshop then it was common for a temporary loan set to be sent out as a replacement if the original set couldn't be taken back the same day. As most of the customers were renting their TVs they were entitled to a replacement anyway. In addition to the van load of spares, engineers would also carry circuit diagrams for many of the more common TVs. 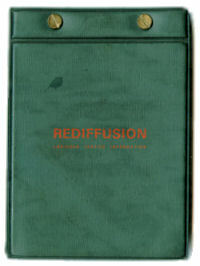 However, it was impossible to carry a full set of diagrams and so Rediffusion issued a small loose-leaf booklet (picture left) which contained information on what they considered to be the most common sets in the field at the time and included lists of the common faults and remedies. I still have my copy of this though it was already slightly out of date by the time I'd received it as some of the older sets listed as "common" were somewhat rare by that time. I remember everyone gathering around a Mark 6 (I think it was) that had come in - the customer was being upgraded to a later model. Because the booklet was loose-leaf it could be updated with the latest pages and old ones discarded. As I was only there for a short time I never had any updates so my copy remained as originally supplied. It was divided into two main sections - the larger two-thirds dealing with aerial TV sets and the remainder concerned with the special Rediffusion Wired sets. Wired sets were the 1960/70s equivalent to cable TV where the TV signal came into the house via a multi-wired cable into a selector switch usually located near the window. A lead from this plugged into a large socket on the back of the TV. To change channels you had to go to your window and change the switch position - TV remote control was still a few years in the future then! There's some more info on the wired system here. 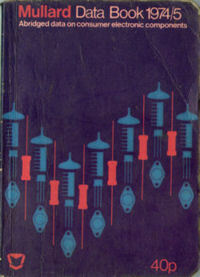 Another common booklet carried around by engineers was the Mullard Data Book (the cover of the 1974/5 version shown right). This contained pinouts of hundreds of transistors and valves plus the usual working voltages. The latter helped with fault-finding as reading the wrong voltage on a device could indicate where the fault lay. One thing I seemed to have a knack for in those days was colour TV convergence. The CRT or Cathode Ray Tube in a colour TV used three separate "guns" for each of the red, green and blue colours. Unfortunately, the accuracy of the electronics at directing all three beams from the guns onto the phosphor in the same place was not so good back then. The TVs had control panels that could swing out of the chassis so that they could be operated by an engineers facing the front of the set. Depending on the model, there could around 10 to 20 controls on this panel each of which controlled a different aspect of the image. The usual way to "converge" the beams was to switch off the blue gun and get the red and green beams aligned. Then the blue gun would be switched on and aligned to the other two. A TV set with bad convergence would tend to display green, red, yellow or blue fringes around objects - usually at the edges of the screen. Some sets were easier to converge than others. The Fergusons were notoriously hard, the Bush sets weren't too bad. The easiest was always the Rediffusion Mk 1 Colour set.